As more and more rainforest disappears, orangutans are coming into frequent contact with humans. As a result more of them are being captured. It is absolutely vital that orangutans be returned to the wild where they can breed and propagate the species. Orangutans are on the brink of extinction, so each individual's genetic blueprint is critical for the future survival of the species. It is absolutely crucial, therefore, that orangutans have a chance to live wild in the forest, where they can continue to have babies and thereby ensure their survival as a species. At orangutan rehabilitation centers in Borneo, captured orangutans are gently helped to prepare for life in the wild. The captured orangutans come through many channels. Some are confiscated from their owners or in customs when they are being smuggled out of Indonesia. Some are rescued from palm oil plantations where they have ended up as a last resort, starving because their food sources have literally disappeared. Some are actually kept by plantation workers as 'mascots' and pets. Preparing for life in the wild can be a long process. Baby orangutans normally live with their mother for the first six to seven years of their life-- until they are strong enough to cope on their own. It takes years to teach the little ones the skills they will need to become independent, wild orangutans. But it's a task that we gladly undertake. They are brought to the centers where veterinarians examine them for diseases in order to prepare them for a new life in the rainforest. When the rainforest is cut down or burned, orangutans and other animals living there are forced to flee to new areas. Many times the orangutans have no other option but to enter into areas used by human such as plantations in order to find food. Unfortunately these encounters often end up with the adults being shot and eaten and the babies being captured. 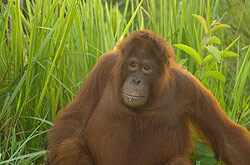 The orangutan is a threatened species and therefore worth a lot of money on the black market. The little ones, with such human-like behaviors and requiring a great need for comfort, become popular entertainment. 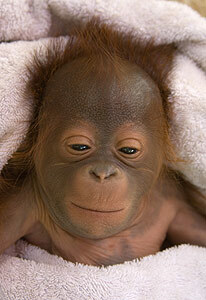 In Asia there is a big market for orangutan babies. In both Indonesia and Malaysia there is great prestige to be able to afford to have a captured wild animal in your home. It is particularly shocking that many of the people who keep orangutans as pets are the very people who should be enforcing the law. Customs around the world are in constant pursuit of people smuggling baby orangutans, but few criminals are caught. The orangutan are often smuggled with the large freighters loaded with the very timber that was once their home. Many of them die during the journey and the ones that do survive are in for a lot of difficulties. The new owners are often completely ignorant of the most basic needs of an orangutan. They are fed the wrong food and often get too much or too little. Illnesses, stress and depression are typical of captive orangutans. It is also common that the orangutans are held captive outdoors in small wooden cages or chained to poles where they are exposed the wind, rain or too much sun. In such conditions, most baby orangutans simply do not survive. Borneo Orangutan Survival (BOS) and International Animal Rescue are in favor of relocating wild orangutans to safer forest areas whenever possible. 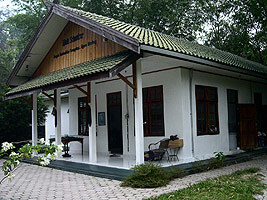 The BOS rescue center in Nyaru Menteng is the largest rehabilitation program for wild orangutans in the world. During the last few years hundreds of wild orangutans have been saved from the devastation caused by the conversion of tropical rainforest into palm oil plantations. Orangutans can often be found in the areas where the plantations are now being established, which means slimmer and slimmer chances for the orangutans to survive. BOS and IAR track the wild orangutans, anesthetize them and bring them to the rehabilitation centers in Nyaru Menteng or Ketapang. In the center they are examined by the professional veterinary staff for diseases while kept in quarantine. They are then moved to safer areas of forest where they can continue their life without danger from humans. About 150 Orangutans have been given new homes through this process. The rest are still in quarantine or at the rehabilitation centers. Some will never be able to be released as they are blind, injured or suffering from serious diseases (often as a result of human contact). But despite this they are now safe from an otherwise certain death on a palm oil plantation. It is illegal to keep orangutans as pets in Indonesia. Non-authorized trade and export of orangutans is illegal in the entire world according to the CITES treaty. This is true only on paper. When police or customs become suspicious that there might be an illegally captured orangutan being transported they are supposed to send a specially trained unit to investigate. Whether or not this actually happens remains to be seen. 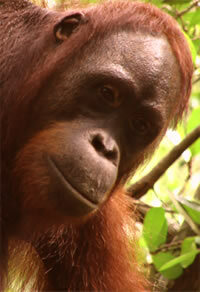 Most captured orangutans can be found within Indonesia. They turn up not only in Borneo and Sumatra but also quite often in Java and Bali, where it is considered a sign of prestige to be able to afford such a ‘pet’. There are also many cases of orangutans being smuggled abroad. There is a special branch under the forestry authorities that has the responsibility to confiscate captured orangutans. 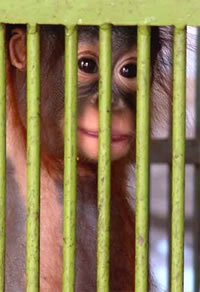 As a first measure the owners are asked to hand over the orangutan to the authorities. If they refuse, police are called to the site. It is a punishable offense to keep an orangutan at home, but it is unfortunately very rare that the consequences are anything more than a warning or a miniscule fine to be paid on site. Many owners actually try to get the authorities to pay the market value before they return the orangutans. The biggest problem in this situation is that people who keep orangutans as pets are quite often politically powerful and relatively well off financially. Bribes are not uncommon. The confiscation generally happens in collaboration with an established rehabilitation center, such as Nyaru Menteng or Ketapang, operated by BOS and IAR, respectively. A veterinarian and a number of experienced co-workers from the center are usually brought along for the confiscation in order to ensure the best possible treatment of the orangutan throughout the process. Bornean orangutans from Central and East Kalimantan are accepted in BOS rehabilitation centers while orangutans in West Kalimantan are brought to Ketapang, which is operated by International Animal Rescue (IAR). Orangutans need to go to other centers based on their DNA. Sumatran orangutans are not mixed with Borneans. This division is carefully adhered to in order to ensure that the two subspecies are not genetically mixed. Nor are different genetic types of Borneans mixed together. DNA testing is the key to getting the orangutans back where they belong– from where they or their parents were illegally removed. While illegal owners may not know the origin of their orangutans– or at least may claim not to– the DNA does not lie. When confiscated orangutans come to the centers in Nyaru Menteng or Ketapang, they are immediately examined by veterinarians. It is crucial to establish as soon as possible which diet and possible medical treatment an orangutan is in need of. The orangutans are given a name immediately which helps for the journal keeping that is done for each individual. Many of the confiscated orangutans are in very poor physical condition. They are malnourished and often suffer from different diseases-- many caught as a result of contact with their human abductors and owners. Therefore it is absolutely crucial that the new arrivals do not mix with the other orangutans in the center. Both small and large quarantine cages are used for these new arrivals. They will stay in these cages until their test results are back from the lab. If a newly arrived orangutan actually suffers from an contagious illness he or she is placed in quarantine for a longer period of time. At Nyaru Menteng a lot of resources have gone into building large and comfortable cages that can be placed in green, forested areas. While they cannot have direct physical contact with the other orangutans, they are at least allowed to see what's out there awaiting them. After the orangutans have been examined and are deemed healthy they are placed in one of two groups depending on their age and skills. Either they will go to the nursery or to the socialization home. 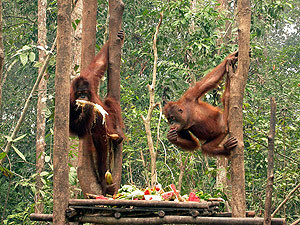 Orangutans no older than 2 years are placed in the nursery where they are taught among other things to climb small trees. In the wild the babies would be with their mother until they are about 7 years old. The infants in the centers are monitored 24 hours a day and each one has two babysitters on constant shifts that become like their "mothers". Just like for humans, the first years of an orangutan's life are very important for their future development. An orangutan mother never leaves her little one. She is constantly by his or her side. A baby orangutan who is left alone by their babysitter will become hysterical and scream very loudly. If the babies are left alone for a longer period of time without comfort and care there is a great risk of them withdrawing into themselves. Stress and grief are among the most common causes of death for young orangutans living in captivity. To sum up, infants need to be in constant contact with a body. In the nursery you will often see the infants wearing diapers, which can seem a little strange as they are being taught how to become wild. As the orangutans spend a large part of their day clinging to their babysitters, diapers can be very handy at least during certain parts of the day. The orangutans grow accustomed to the diapers quickly and do not seem to mind. The smaller infants are fed milk from a bottle to start with and are then slowly taught to eat different kinds of fruit and to drink from their own bowls. Please remember that putting clothing on any non-human ape for entertainment purposes is exploitative. Apes are not meant to wear human clothing. We don't put the diapers on the babies to be cute. And yes, we are well aware of how adorable it is... just remember that it is not the same as dressing up apes and using them in commercials to sell products! The larger orangutans are carefully evaluated before deciding where to place them. As a general rule they will be place in so called "socialization" cages where they live together with 10-15 other orangutans and will learn how to live in a group. Most of the confiscated orangutans have been brought up chained to something in order to restrict their movements and keep them tethered to the ground-- lest they mange to escape, which they would naturally do. They have also been living with humans as their only companions. It is therefore imperative for them to get to know other orangutans and create their own social network before being released into the wild. While all this is going on, they are carefully observed by the trained staff. They are observed when climbing, eating and building their nests. There is a log book for each individual, so the staff can keep track of them all. Many confiscated orangutans have been raised on rice, tea, coffee and other human food, and they have to be weaned off this as soon as possible. In the socialization cages they are given milk and a large choice of fruits several times a day. Towards the end of the day the orangutans are given branches by the staff in order to build their nests. The orangutans help each other build nests within the cages. In the wild orangutans live in nests that are 40 feet above the ground and normally build a new nest every night. Up in the trees there are no mosquitoes, which are present in the cages. In the cages, the orangutans often use sleeping bags and blankets to protect them from insects. The socialization cages are located inside the centers and there are guards around the clock. Sometimes the orangutans manage to escape from the cages-- which often leads to a wild chase around the area to capture the "fugitives". This can actually be a positive experience as the staff can observe and evaluate how well the orangutans climb and make their way through the forest. As a rule most escapees return home in the evening in time for the last glass of milk. When the orangutans have shown that they can handled themselves in the socialization cages without any problems it is time for the next move. Once the orangutans can successfully fend for themselves it is time for them to move to a so-called "halfway house"-- located a little more than half a mile from the center. The orangutans who make it here are halfway to their new life as wild forest dwellers. The new home consists of a large socialization cage, a small pond and lots of tree and forest to play in. Human contact at the halfway home is purposely limited. Four people work at this site and are responsible for 3 to 4 orangutans per person. 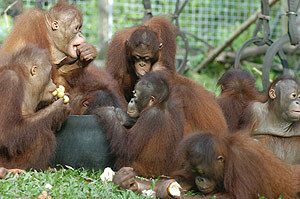 Every morning the caretakers gather and go into the forest where, during the day, the orangutans are free to roam wild. The orangutans can climb the trees, look for food or build nests. This is where the actual rehabilitation process starts. The more time the orangutans spend in the trees the better. They are fed fruit that is placed on long sticks so that they down have to climb down from the trees unnecessarily. Wild orangutans rarely spends any time on the ground so it is important that they learn to spend more and more time up in the tress. Late in the afternoon the groups gather again. If any of the orangutans feels like spending the night up in the trees they are free to do so. In the beginning most of the orangutans tend to follow their group home and spend their night at the house, but eventually they prefer to stay out all night. Once the orangutans have learned to build solid nests and are choosing to stay in the forest more often, it is time for the next stage in the rehabilitation process: the Islands. Once the orangutans can build their own nests and find food in the forest they are ready to be placed into the wild rainforest. But before that, they are released into a special protected area so that they can be monitored and the staff can ensure that they are really ready to be released into the wild. Close by BOS Nyaru Menteng there are several uninhabited islands in the middle of a river. Here the orangutans can live a life that is very close to life in the wild. The islands are often inundated which means that the orangutans have to stay up in the tree tops. The islands are called Kaya (120 hectares), Palas, (22 hectares) and Bang Amat (35 hectares) and almost all the vegetation that the orangutans are used to can be found in abundance. 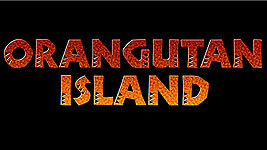 It is here that Animal Planet's series Orangutan Island takes place. Slowly but surely the orangutans become habituated to looking for their own food, but the staff distributes fruit in the same areas every day to ensure that all the orangutans are getting the necessary nutrition. "Unexciting" fruit is the norm-- in order to encourage the orangutans to look for more savory treats on their own. Most of the orangutans feel quite insecure when they arrive on the islands and try to get back to the main land by jumping onto the boats. But pretty soon they have learned to appreciated their new life with the other apes. After a while it is hard to even tempt them to come from the trees when the staff come for the occasional visits. After a long period of supervision the orangutans are ready to be released into carefully chosen areas in the wild. The release sites must meet a number of criteria. They have to be free from human beings. The forest must have been submitted to a limited amount of impact and there has to be diversity of fruits and plants that can feed the orangutans. The site also has to be in the area of Borneo that the orangutans originate from in order to avoid genetic mix up with other wild populations. Once such an area has been found, the difficult task of getting the orangutans to the site begins. It is by definition almost always a very remote area. Helicopters or small planes that can land on nearby rivers have to be used. Once the orangutans have been released into the wild, all that is left is to hope that the rehabilitation process has helped to make them strong enough to survive on their own. By visiting the area periodically professional staff try to get a thorough understanding of how the orangutans are doing in the wild. The orangutans must be lured down from the trees in order to take blood samples that will help determine if the food is varied enough or if they have caught any illnesses. Fortunately most of the orangutans who have been released are doing well. It is always hard for the staff to say goodbye to an orangutan with whom they may have spent years. It's essentially no different than saying goodbye to a friend. But it is also incredibly rewarding to see that an abused and often sick orangutan that was confiscated from a palm oil plantation can be successfully released into the wild so that he or she can live a normal life. So that's the rehabilitation cycle... we bring them in, try to teach them to be orangutans, and send them back out. There's one big catch: Without any forest, there's nowhere to send them! So we have to protect the forest, replant wherever we can and STOP DESTROYING THE RAINFOREST. In the end, we'll all be better for it.